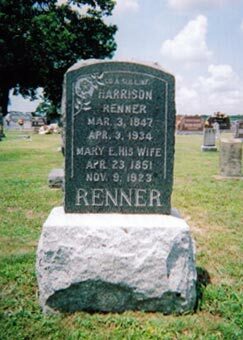 Harrison Renner was born in Indiana in 1847. Renner first served with the three-month regiment the Fifty-Fifth Indiana in 1862. He was drafted in the Illinois draft of 1864 and enrolled in the Fifty-First in September. His introduction to the regiment's war was the march out of Georgia to Alabama and Tennessee to stand in the way of Hood's Tennessee campaign. Renner survived the melee of the Battle of Franklin (a number of his fellow draftees did not) and was mustered out on June 16, 1865. After the war, Renner earned his living as a farmer in Missouri. Harrison Renner, one of the last of the Civil War Union veterans in this county, died Tuesday, April 3, at 87 years of age. Though he had been ill for twenty-three months, his condition did not become serious until five days before his death. Funeral services were conducted April 4 by Rev. Roy Blalock of Lebanon in the Presbyterian church at White Oak Pond, music being offered by the choir. Burial was in the cemetery of the church. Mr. Renner was born on March 3, 1847. His first marriage took place on Sept. 8, 1867, to Miss. Elizabeth Sanders. To this union wwas born seven children, one of whom died in infancy and another at the age of fifteen. The surviving children are Calvin and Lige Renner of the Russ community, Albert Renner of Springfield, and Mrs. Edwards and Walter Renner of Lebanon. After the death of his wife, on Nov. 9, 1923 he married Mrs. Margaret Randles, on Dec. 7, 1927. Later he was married to Mrs. Lucy Davis, who survives him. Twenty-five grandchildren, twenty-one great grandchildren, and two great, great grandchildren; a sister, Mrs. Hannah Lockwood of the Russ district, and John Renner of Springfield, a brother, are the other survivors. Grave photo and information, courtesy of Renner's great great grandson Thomas Tait. Harrison Renner photo at upper left from New Hope Baptist Church book at the Lebanon-Laclede County Library in Lebanon, MO. Harrison Renner, Compiled Service Record, Records of the Adjutant General's Office, 1780's-1917, Record Group 94, National Archives and Records Administration, Washington, D.C.